Marlborough’s new primary school, Marlborough St. Mary’s took a major step forward today with a “Topping Out’ ceremony. Sited on the current St Mary’s Infant school site combined with the old Van Diemen allotments area of many years ago, the new school sits on an overall area of approximately six acres – with Ducks Meadow at one end and Van Diemen’s Close at the other (see aerial pic), offering children a spacious environment in which to learn and develop. he ceremony was conducted by Bishop of Ramsbury – Right Reverend Ed Condry and Rev. Canon Andrew Studdert-Kennedy, Team Rector of Marlborough, along with Keir Construction Managing Director, Mark Pausey. 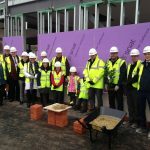 They were joined by staff, governors and pupils from St Mary’s as well as Richard Gamble and Clare Medland from Wiltshire Council, Susan House from the Education Funding Agency, and members of the Kier construction team. Traditionally an evergreen tree was placed at the top of the building but it is more usual today for an evergreen plant to be presented. Kier Construction have donated a Camelia to the school. Pupils from Marlborough St Mary’s administer the Blessing by splashing the building with Holy Water under the supervision of Bishop EdBishop Ed of Ramsbury prayed for the future of the building and of the school, while Rev. Andrew Studdert-Kennedy read from St Paul’s Letter to the Ephesians. In the Christian tradition, Bishop Ed together with some pupils, blessed the building with holy water, splashing the bricks and fabric of the building using twigs of rosemary. Headteacher Anne Schwodler said, “It is really lovely to have the input from the Bishop. We are a Church of England School and the Christian ethos is important to all of us.” The ceremony ended with pupils helping to lay some of the bricks on the outer wall and a tour of the building. 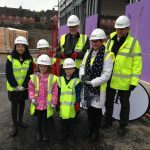 PUPILS, teachers and builders marked a key milestone in the building of St Mary’s new school by attending a ‘topping out’ ceremony on Thursday. The afternoon’s topping out ceremony, which is held when the building reaches its highest point, involved pupils getting stuck into a bit of building work by laying a brick or two after the Bishop of Ramsbury, Edward Condry, had said a few words and sprinkled some holy water over the cement. With just eight months to go until the juniors and infants will be under one roof, when they move to their new based behind the school’s current site in George Lane, excitement over the move has never been higher. Headteacher Anne Schwodler said: “All across the school, be it staff or pupils, the excitement and sense of anticipation is growing all the time. “Kier, who are building the new site, are doing a fantastic job and although we are a while off from completion it is looking impressive already. “It was really lovely to the bishop of Ramsbury here for this ceremony. We are a proud church of England school and we welcome him here today. 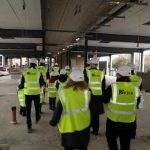 After the brick laying and topping out ceremony, guests were given a tour of the building and were told where the hall, library, classrooms, playing field and multi-use games area. When the work is completed, the new amalgamated school will be able to take up to 420 pupils, including spaces for 20 with special educational needs. “What is so great about the new place is that the access for people will be so much better and the facilities will be fantastic,” said Mrs Schwodler. “The current sites have served us really well and are lovely old buildings but now is the time for change and it will be great to merge the two schools as one big family. Andy Jones, Kier contract manager, said: “We are definitely on schedule for the school to move in this September. I thought the kids did a great job. Hopefully we can sign some of them up to help out a bit more, they certainly have the enthusiasm to be great brick layers. The construction of the new school is expected to be completed by July.